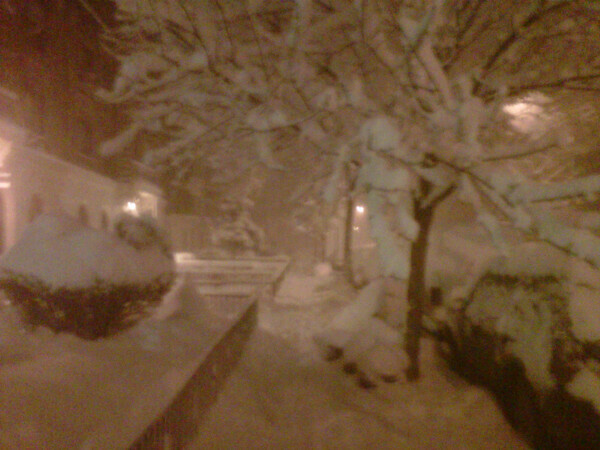 Kevin snapped this as he was walking home from the subway late last night. I was already fast asleep when he arrived and woke up at 7am to an email from a partner at the law firm telling us all to stay home. Snow day! I’ve come off the ledge since my last post. Turns out I was experiencing some PMS-inspired moodiness. No one died and I’ve felt a lot better over the last few days. This is the second time I’ve had a real snow day off from work in the last month. What could be better?? I’ve realized something recently that I can’t deny. This job is exactly what I need right now. I’m hesitant to say that because I don’t want to have to work there for a long time. But the circumstances of my current career situation being what they are, I’m grateful for this setup. I’m surprised and delighted every single time I get paid. I have relative flexibility in the sense that I haven’t had to miss anything yet – I’ve been able to take off for important HST shows and I’ll get to go on a family trip in April. My health insurance just kicked in last week and that’s a nice feeling, and I’ve been able to make a serious dent in some minor credit card debt I’ve been carrying around. PLUS, Kevin’s able to work from home right now managing HST gigs, working on his own projects (He and some colleagues launched SiCKPUPPY.tv this week! ), playing Mister Mom to our two babies cats and doing some important research on what we’ll do next with Fanny & Jane. My boss has been out of the office this entire week. It means I have time to put toward my own career goals…saying nothing of today, of course, which I’ve spent at home in my pajamas doing laundry and writing. He travels a fair amount and it’s always a welcome break when he’s gone. When he’s in the office, I generally want to be instantly whisked away to another world. But it’s all still bearable. And in exchange for the support this job is providing my lifestyle? I’ll take it. I had a great time on Sunday at brunch with a few incredible women I’d never met before. The get together was organized by our dear friend Michelle (the When I Grow Up Coach), who knows us each personally and thought we might make a good group of ambitious Brooklyn ladies who can support each other in our disparate career journeys. It was a relief to meet and connect with these women, who are all exploring and uncovering how to navigate their careers as entrepreneurs and creative people. Our conversation was reassuring and comforting. So as hard as it is to be patient, I’m working on letting it unfold. Today was my first full day alone at the temp job. I didn’t finish working until 9:30pm! I went in for a few hours on Sunday too. Boo. Today was a race against the clock, filled with lots of important legal details I was terrified to screw up. I honestly don’t think these two weeks will be that bad (and ca-ching, ca-ching! the money’s good! ), but right now my back is on fire and I’m exhausted. It’s funny to be revisiting this lifestyle where I can’t fit in a workout, barely have time to eat lunch and feel like my retinas are burned into my head on the hour-long commute home. That stuff, along with the disjointedness of coming home knowing I won’t have time to clean up or do laundry for a week and a half, is some of why I quit my job. I’m not build for the nonstop race, I need time to reset. Harvard Sailing Team‘s new short film will premiere at the Friar’s Club Film Festival this weekend, and we all get to go to the screening! We worked hard on our little movie and had a great time making it, so we’re excited to watch it on the big screen. There’s also an after-party and an awards ceremony. Should be a super-fun weekend. Jen+Steve, my two person improv team, won our first round at the PIT’s Sketchprov tournament. Winner of the whole event gets $2500. You never know! My Acting for Sketch & Scripted Comedy class starts October 21. I’m excited and nervous! Eep! And I’m still doing as much writing as I can, whenever possible. Fanny & Jane…I haven’t mentioned in a while – huh? Well, as you know, we took a summer hiatus. The unofficial and official answer about what will happen this fall is: we don’t quite know yet. We know we can’t have the same experience we had last season, which was very productive, busy and lucrative, but it was also SO MUCH WORK OH MY GOD. And not in a great way. So stay tuned. Decisions will be made soon. Oh, and shut the front door, I’m turning 30 in a month and a half. Yeesh. We’ve been having some seriously blazing temps here in NYC for the last week. I love warm weather, but these have been painfully hot days even for my taste. This morning was a smidge cooler than it’s been though, and a bit overcast – a welcome relief especially on a day when Harvard Sailing Team trekked out to World’s Fair Marina in Queens for a photo shoot! We spent a fun, easy morning at the marina with our fantastic photographer, Eric Michael Pearson. I can’t wait to share the pics. After the shoot was over, I grabbed some lunch in the city and then I spent the afternoon putting the finishing touches on a huge batch of red velvet cake bites (3o0 of them, to be exact) to ship off to Arkansas tomorrow morning for a friend of a friend’s wedding. This is the official official 100% without a doubt last order Fanny & Jane will be doing this summer. The bride placed her order back in December, so I had to honor it, even if it means overnighting the cake bites to her in a tightly packed cooler. Hopefully they’ll arrive intact! And now I’m off to see two of my HST teammates in their two-person sketch show, The New York Smiths. Chris and Rebecca moved to LA earlier this year (which you probably know if you’ve been reading this blog for a while) and they’re back for the month of July! Looking forward to seeing what changes they’ve made to their adorable show. When I get home tonight, I think I’ll crash onto the couch, wish I was a millionaire for about thirty minutes, and then I’ll get back up and do some writing work. Because I’m not quite done yet today. Oof. It’s been a long week. There’s a stiff drink in my future. So, as you know, I quit my desk job 8 months ago to pursue stuff that makes me happier. And I’ve been doing that. I’ve been writing, which I love, I’ve been baking, which I also enjoy very much, and I’ve been acting, telling jokes and having fun collaborating with talented people, which makes me feel very happy and alive. I’ve received so many emails and comments over the last year from people telling me that what I’ve done inspires them. Thank you!! That makes me feel humble and grateful. Meanwhile, I don’t always know where the next significant paycheck is coming from and I’m confused as hell half the time. But I’ve gotten by (and eaten well) for 8 months. And I’m not dead yet. So hopefully I’m onto SOMEthing here. Some times are fantastic, others are hard. Today, for instance, I woke up feeling like I’ve lost my mind lately. I’ve been confused, moody, uncertain and feeling generally lost for a few days now. Par for the course, of course, but still difficult. I mentioned these feelings to the boyfriend this morning. And I ended up crying over my iced coffee. Before I tell you my big Fanny & Jane news, I have to share this shot of the Greenpoint Food Market that was featured on the New York Times Dining Blog today! You can see Faryn and me right there in the middle! (She’s in plaid and I’m behind her.) Mom! The New York Times!!! Unfortunately, the related article isn’t so exciting. It explains that the beloved, “scrappy and creative” Greenpoint Food Market is canceling its June 26 event, due to New York City health code requirements that GFM vendors may not have been meeting. It’s a real bummer that this fantastic market is going to be skipping a month. Fanny & Jane has participated for the last few months and it’s been a great experience. But I have faith that JoAnn Kim, the market’s founder, will be bringing it back in no time. She’s a savvy young woman, and the GFM vendors who stand behind her are nothing short of innovative, ambitious and talented. Anyway, on to our own Fanny & Jane announcement!! I have some interesting news. Faryn and I (and Kevin, who does more than his fair share for the biz) have decided to put the bakery on a summer hiatus. We’re going seasonal! 1. THE HEAT. There’s no good way for a small operation like ours to be making, shipping and delivering chocolate or melt-able sweets in the summer time. We’ve been doing it up until just yesterday and even that was really pushing it. For instance, I delivered sweets to the (fun! fabulous!) Blog Out Loud event last night in an awkwardly heavy cooler filled with ice packs. (Check out that link for some great shots of the event and our sweet treat table.) And even the ice pack method is a dangerous game when it comes to making sure the desserts arrive deliciously intact. This is our first summer with the bakery, so we’re learning! 2. THE PROCESS. It’s time to step back from the biz for a few months. I feel good about this decision, it feels right – it’s time to reevaluate exactly what we’re doing here. We’ve had a ton of success since we went full speed ahead with the bakery last fall. We promised ourselves at the time that we’d just do the holidays, and then reassess. We learned a lot and had a fantastic (and exhausting) experience in December. Then 2010 came, and we kept going. It’s been over eight months since we’ve given this our all. There are pros and cons, but either way, it’s time to take a minute and make sure we’re headed down the right path, without the daily and weekly challenges of actually baking the sweets distracting us from reevaluating things. If I’ve learned anything in the last year, it’s that there is always time and room in business to step back and reassess what you’re doing. Businesses that aren’t willing to change, or aren’t able to embrace the unexpected are likely to fail. Flexibility is king when it comes to running a company. We were not experienced business women before the bakery. You know – many of you have witnessed our journey from the beginning. And we’re still learning every day how to be entrepreneurs, own our own company, make room for other pieces of our careers, and make it all work. As I’m sure you’ve noticed, Faryn and I both do a lot of other things besides Fanny & Jane. We’re sketch comedians, which can be a full-time job some days. Plus Faryn has a day job. (Although, she’s on a summer hiatus right now! Woot!!) And I do…whatever the hell else I do. THE POINT IS , we both have fistfuls of goals and aspirations and we need a break from this one, even if it means turning down orders for a few months. There are certainly risks to this decision, but like I said, I know this is the right move. And the hot, sticky, melty summer is the perfect time for it. Make sense? I can say that we absolutely love making sweets for you, and we are thrilled that you love them. The connections we’ve made with customers, other vendors, cafe owners, dessert lovers, bloggers and entrepreneurs alike have been wonderful and unexpected. Expect Fanny & Jane back in your lives in the fall. We don’t know exactly when, nor do we know in precisely what capacity. And thank you, as always, for your undying support. Harvard Sailing Team was in the Cosmopolitan Magazine blog tonight! These videos just won’t stop. It’s nice. Definitely nice. Here’s an article I wrote on Gather about the hot press HST’s gotten in the last two days alone. For my part, I’m having fun with this ride, for sure. I’m also in the midst of learning how to juggle all the stuff that’s popped up lately! Between the bakery, writing for Gather, writing for The Examiner, Harvard Sailing Team, The Baldwins AND Jen+Steve, my life is busy right now! It’s lovely of course, because it’s a wonderful kind of busy filled with all the things I like to do in my life (!!). But you still have to learn to make time for it all. Until yesterday, I hadn’t exercised in a week. I’m still practicing how to strike the balance. It’s fun to learn to adjust to this new busy lifestyle. I remember the months of January and February, which were dark, cold, boring months when I was so un-busy that I did a 30-Day Yoga Challenge! Ha. Tomorrow night is an HST show – looking forward to it! We have some great stuff lined up. I mentioned on here a couple months ago that I was taking a 3-month hiatus from the team. Well, hiatus taken, and I’m “coming back” a bit earlier than expected. Other news? Faryn wrote a great post about Fanny & Jane at the Greenpoint Food Market. If you live in NYC and you haven’t been to the GFM, you should come. You guys! It’s totally cute and great. They’ve got live music. It’s indoors, which is not quite as fabulous as being outdoors in the warmer months, but it’s not that big of a place so you can do the whole thing in less than an hour, and the atmosphere is so fun and lively, you barely miss being outside. So many fabulous, up and coming Brooklyn food vendors present their wares at this market, and most offer free samples. Last, but certainly not least in this update, I took a yoga class today for the first time in a very long time. It was bliss. And I also hung out with little Otto Grimwood today, who always reminds me what being in the moment looks like.